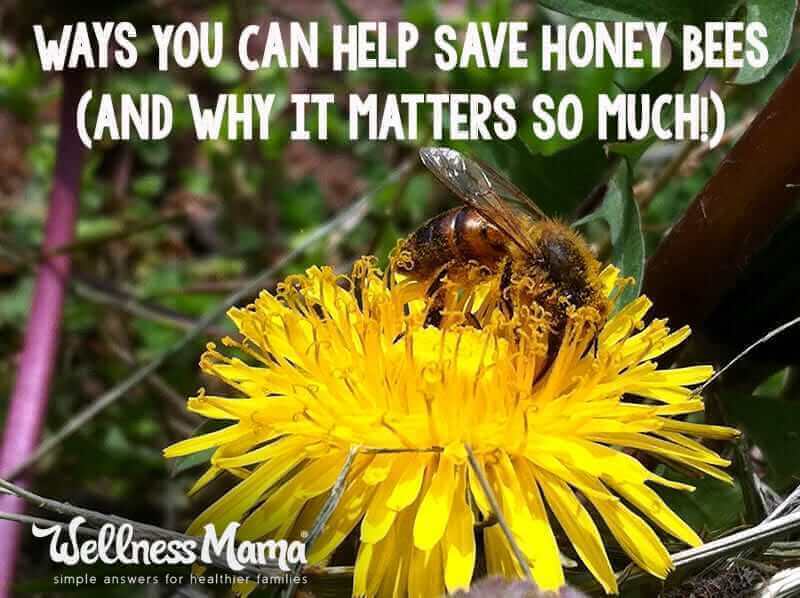 While I love my beeswax candles and have many healthy uses for honey, the importance of the honey bee goes well beyond what they produce directly. Many of the foods we eat rely to some degree on the honey bee for pollination. For crops like strawberries, honey bees increase the number and size of the berries, while other crops like almonds rely 100% on honey bee pollination. If the honey bee population declines, many crops will suffer. 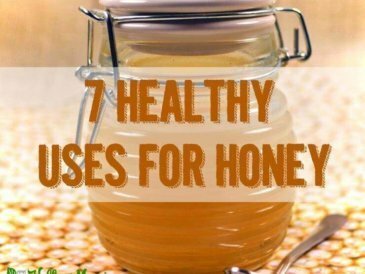 No honey bees, no almond butter. High bee losses last year (42% of colonies died from April 2014 to April 2015) have lead many to ask what they can do to help. Here are a few steps that each of us can take to do our part and help keep the honey bee population strong. With the quest for a greener, weed-free lawn and pretty, longer lasting flowers, we have depleted many food sources for the honey bee. Not only have many homeowners eliminated dandelions (a great early spring pollen source which helps boost brood rearing and natural superfood) and clover, many trees and flowers sold today have been modified. These modifications may increase their beauty, but to the detriment of their nectar production and therefore their benefit to the honey bee. There are many beautiful flowers that provide bees with the pollen and nectar they need, such as Sunflowers, Asters, Black-eyed Susans, Purple Coneflower, Horsemint, Blue Giant Hyssop, Hyacinth, Borage, Crocus, Zinnias, Asters, just to name a few. Your local greenhouse is another great place to visit and ask about planting for honey bees. During one of my visits to a greenhouse this spring I noticed an entire section of flowers and shrubs dedicated to attracting pollinators. While many of us think of planting flowers for bees, what many people don’t realize is that in most areas the honey bee’s primary source of nectar is from flowering trees. However, all flowering trees are not created equal. For example, the very popular Bradford Pear, with all its many flowers, is a very poor nectar source for bees. There are many great landscaping trees that the bees love such as Tulip Poplar, Maple, Redbud, Cherry, Crab Apple, and Holly. Choosing one of these beneficial landscaping trees is one of the best ways to feed the bees in your area. While bees are not “pests,” most “pesticides” do not discriminate. Even organic pest controls can have a negative impact on bees and therefore it is important to keep honey bees and other beneficial pollinators in mind before using any pest treatments. It is also important to make sure to avoid buying plants that have been treated with neonicotinoids. “Neonics” as they are sometimes referred to, are a type of pesticide that becomes part of the plant and actually turns the plant itself into the pesticide which includes its pollen and nectar. Neonics have become widely used in U.S. agriculture and many believe that it could be one of the factors contributing to increased bee losses. Plants that have been treated with neonics (which is done through the application of a seed coating) should be clearly marked and easily avoided if you are keeping an eye out when making your plant selections. Not only do beekeepers face increased bee losses from the Verroa destructor (a fitting name for a harmful invasive bee mite), increased pesticide use, and disease, they also have to compete with imported and often adulterated honey sold at bargain prices in supermarkets. Buying your honey from a local beekeeper who you can get to know and trust will not only go a long way toward supporting a healthy bee population, it will also ensure you get good, quality honey. Many beekeepers also sell beeswax that they gather and refine from the cappings they remove during honey extraction. 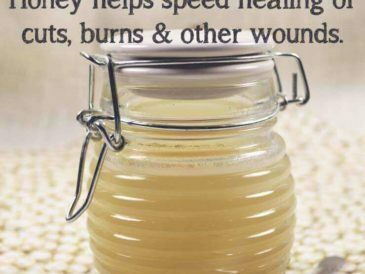 I use beeswax for lotion bars, homemade lip balm and for beeswax candles. 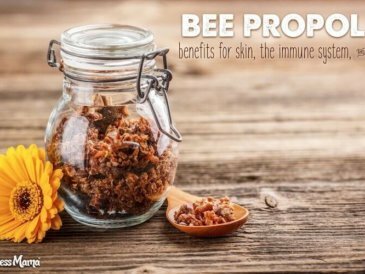 Royal jelly, bee pollen, and bee propolis are other useful bee products that are beneficial for reducing allergies, boosting immunity, nutrition, and more. Check out this podcast to learn about the full spectrum of bee products and a great company that makes them. Buying organic food is not only good for you, but it is good for the honey bees. The more organic food that is purchased, the higher the demand will be. As the demand for organic food goes up, pesticide use will go down. Less pesticide use creates a safer environment for the honey bee. While beekeeping is growing in popularity, not all areas allow keeping bees within the city limits. You can support beekeepers by becoming informed about the ordinances where you live and supporting movements to allow backyard beekeeping in your community. Another way to help the bees and beekeepers alike is to keep your eye out for swarms. Honey bees propagate by sending out swarms containing their old queen and about half the bees in the hive, meaning thousands of bees. If you have ever seen a swarm in motion it can be one of the most intimidating and at the same time thrilling things you will ever experience. After leaving the hive the bees will settle in a large cluster of solid bees anywhere from the size of a soft ball to the size of a volleyball. The intimidating nature of this enormous number of bees has sadly lead to many cases of homeowners panicking and spraying the harmless cluster of bees with any number of deadly sprays. While these swarms can be intimidating, swarming bees are actually at their most docile because they do not have a hive to defend and have filled their bellies with honey for the long journey to establish a new home site. If you spot a swarm, call a beekeeper and they will come (or pass word to another beekeeper) and safely remove the bees and add them to their apiary. If you don’t know any local beekeepers, check the label on the last jar of local honey you purchased and give that beekeeper a call. If you still can’t contact a beekeeper, a quick post on social media will likely reveal a beekeeping connection you didn’t even know you had. Several years ago I decided we needed more bees for our garden and began the process of starting a hive. When I set up my bee hive I got them in place and carefully opened the entrance. When a few bees came out I jumped back and reacted like they were out to get me. I had to laugh at myself and at this ingrained reaction. Beekeeping became a lesson in “unlearning” what I thought I knew about bees. The first thing I had to do was really think back throughout my childhood at the different encounters I had with bees and getting stung and I had an epiphany. All my experiences with “bees” were not with honey bees, but with yellow jackets and other wasps. I had to recondition myself to separate honey bees (wonderful, honey making pollinators to whom we owe so much of our food production) from wasps (awful, nasty stinging machines). I now find myself asking people who have a negative story about “bees” if they are actually talking about honey bees or wasps. When you grow in respect for the honey bee and perhaps stop to watch one move from flower to flower, you find yourself thinking about them completely differently. Suddenly, dandelions and clover in the yard look less like weeds to be removed and more like nourishment for a bee colony. A buzzing honey bee becomes something to watch and follow in the yard rather than something to fear. Once we gain this new respect for honey bees and the ability to distinguish them from wasps we can pass this on to our kids as well. If anything, my kids have too little reservations and I have to remind them not to pick the bees up. To deepen your knowledge of bees, consider picking up a book on beekeeping, even if you don’t plan on keeping your own bees. I bet you will find them to be even more fascinating than you thought! If you are a nerd like me, you might enjoy a more technical and research heavy book on bees such as The Buzz about Bees: Biology of a Superorganism or Honeybee Democracy. If you are looking for a more hands on approach to saving the honey bee and want to add some excitement to your life, consider becoming a beekeeper. Keep in mind there are start up costs and a learning curve so it will take commitment, but it is sure to give you a deeper admiration for the honey bee and some amazing experiences. If all goes well you may even get a bit of honey! The key to starting out on the right foot is to start planning early. Begin now by reading about beekeeping and more importantly, by making connections with beekeepers in your area. Ask around, it may surprise you to find out that someone you know keeps bees. Many areas will even have beekeeping associations that meet monthly. This is a great place to make the connections that will become so valuable when you start your first hive. Interested but not ready to take the leap? That’s okay, you can still get up close and hands on with the bees. Not Quite Ready To Be A Beekeeper Yet? Beekeepers have a passion for what they do and many of them would be more than willing to let you tag along for a hive inspection. 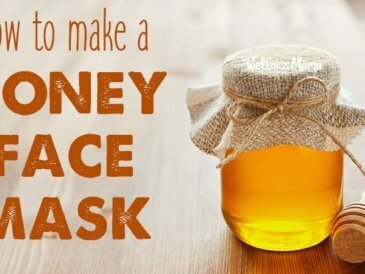 You will want to make sure that the beekeeper you arrange with has an extra bee suit/veil or you may even consider buying yourself a bee suit. Another option is to bring the bees to you! There are many beekeepers out there that would love to have another location to keep a hive. 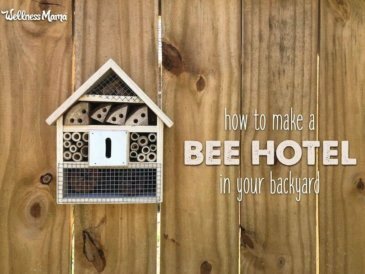 You could offer to host a hive in your yard or on your land. Keep in mind that this means the beekeeper will be stopping by to inspect the bees as often as weekly in the spring. 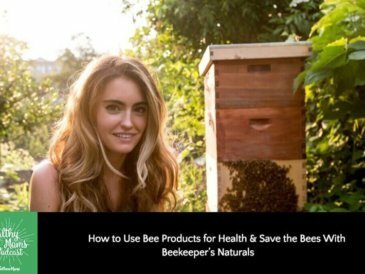 You should also make sure that you are ready to make the commitment, because while hives can be moved if you change your mind, you can imagine there is some work involved in relocating an active hive. But if you’re up for it, this could be a great way to help the honey bee population and gain firsthand experience that just may become a stepping stone to getting your own hive.